Iran’s environment chief has condemned the savage killing of stray dogs in Shiraz, calling for a fitting punishment for the perpetrators. Protest rallies have been held across Iran after a gruesome video went viral featuring the brutal killing of several stray dogs in an industrial park in Shiraz. The three-minute video shows the dogs dying after apparently being injected acid by men wearing masks. Shiraz Municipality has denied any involvement in the killing of the dogs, saying it does not supervise the industrial parks. The recent video has prompted people and officials to ask sources of emulation about the Islamic view on animal abuse. Senior Shiite clerics have unanimously rejected the killing of animals as religiously and ethically unjustifiable. For instance, Grand Ayatollah Hossein Nouri Hamedani has said that the killing of non-harmful animals is not [religiously] permissible. Grand Ayatollah Seyyed Mohammad Ali Hosseini Alavi Gorgani has said that it is not acceptable to kill animals under the pretext of protecting the environment and [people’s] health by arguing that there are other means to that end. Grand Ayatollah Nasser Makarem Shirazi has said that the killing of animals is permissible only when they endanger human lives and there is no other way [to eliminate the threat]. Officials too have condemned the brutal act, vowing to pursue the case and bring those behind it to justice. It came as a group of animal lovers gathered outside the Environment Protection Organization in Tehran on Sunday, protesting against the killing of stray dogs in Shiraz. 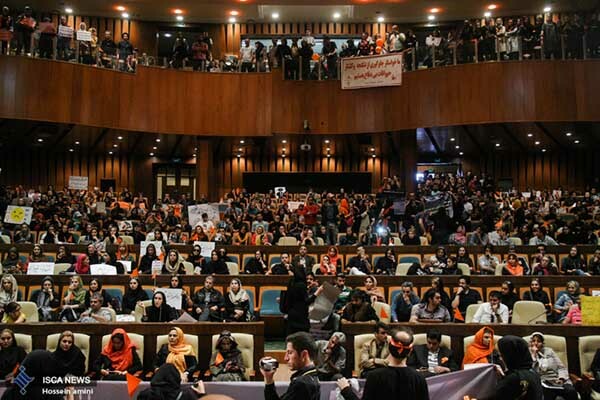 Ahmad Nabavi, an official with the Environment Protection Organization, told the protesters that the EPO has sent a letter to a Shiraz court asking for the punishment of those involved in the brutal killing of stray dogs in the city. He further said that the environment organization stands by the protesters until the cold-blooded killers of the dogs are punished. Nabavi went on to say that measures should be adopted to help animals be treated properly, adding that rabidanimals should be identified and collected. Protesters also signed a petition, asking for an immediate end to the inhumane act. 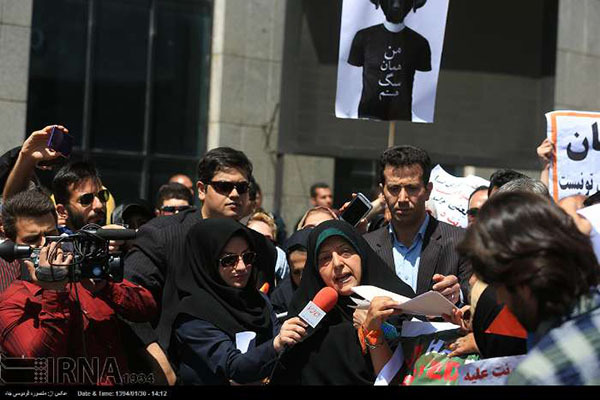 Mohammad Darvish, another EPO official, said in the protest rally that the environment chief has – in a letter – asked the head of the Fars Provincial Environment Department to follow up the case and identify and hand in the dog killers to judicial officials. The environment organization has released guidelines on treatment of unclaimed dogs and other animals which wander in cities, he said, adding that we need to adopt ethical methods to neuter the homeless dogs and identify the rabid canines. This way we can control the stray dog population, he stressed. Darvish went on to say that Iran’s wildlife will definitely undergo change after the current protests against the gruesome killing of stray dogs, adding that the environment protection will become legally mandatory [in the country]. We are following the case through legal channels, trying to bring to justice both the perpetrators of these savage killings and those who have ordered it [the acid injection], he said. Darvish also said that the organization has studied the world’s valuable scientific experiences and compiled a style book on treatment of such animals, adding the style book will be communicated by the Interior Ministry [to government agencies] to help make such inhuman acts a thing of the past. The EPO director thanked people for the responsibility they feel toward the wildlife and said that animal cruelty is not acceptable under any circumstances, adding that the EPO will follow the Shiraz case through the provincial department of environment protection. She also said that officials in Fars Provincial Environment Department have said that several leads have been found, but that there are some gray areas in the case because the municipality has denied the incident. Ebtekar then criticized the legal loopholes that exist in animal protection law, saying that the EPO has general regulations on the wildlife, but there is nothing specific on the rights of dogs and cats. We are trying to define a legal framework for animal rights so that we know what should be done in such conditions, she said. The environment chief further said that all responsibility lies with the municipality and its districts and that the Environment Protection Organization is not legally responsible for such cases.